The Tibhar Samsonov Force Pro blade comes assembled with Evolution MX-P rubber. THE RUBBER: The Evolution MX-P rubber makes no concessions in speed and spin, and with the perfectly adjusted pimple geometry, it allows for more flexibility and extra energy conferred to attaching balls. OVERALL: This combination is recommended to the offensive player that wants to excel in the agressive topspin game. I appreciate the glue job. 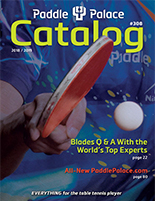 If you are tired of becoming unglued get a paddle palace combo. The rubber does get dinged up easily, especially on the edges. I got 45 days of good play before my first edge ding. Despite the edge ding the rubber still performs well. Worthy speed, spin, and control after 45 days. I definitely walked into most of my matches with a racket advantage. this combo blade and rubber has been my choice for my last 3 purchases. speed and spin are accurate to rating and the control has been by far the best I have experienced in my last ten years of playing. I corrected the rubber edge problem, mentioned in a previous review, by having the edge tape placed up the top edge of the rubber sheet. I have a habit of hitting the table with my paddle especially on push strokes. I would recommend this combo to lower rated players who like playing aggressive offense style. being a lower rated player myself, this combo has enabled me to take games and some matches off of 1500 - 2100 rated players. My next purchase will be this combo. why change something that works well for you? Problems with the rubbers? Rubber or Cleaner? I agree with one of the reviewers about the rubber being torn around the edges after a couple of months of usage. Also, I use Paddle Palaces cleaner. After a couple of months, the rubbers concave slightly around the edges, very slightly, which can only be observed under a different light condition, and then small chunks start to break away. Its no problem in terms of negative effect on the games, but it seems like the rubber could last longer if this didnt happen. So, the question is: Is it the rubber or is it the cleaner solution? The paddle is beautiful and very well put together by Paddle Palace. It didn't take me too long to adjust to the extra power this paddle provided me, and my first impressions were that this was easily a 4 star paddle possibly 5 stars, but it wasn't too long before the rubber started to shred and peel along the edges. I read many great reviews about this specific Tibhar rubber before making the purchase, so I thought it would be a great purchase. The paddle was put together exceptionally by Paddle Palace, but the rubber simply did not hold up as long as it should. Maybe I just got an unlucky set of rubbers from the factory.